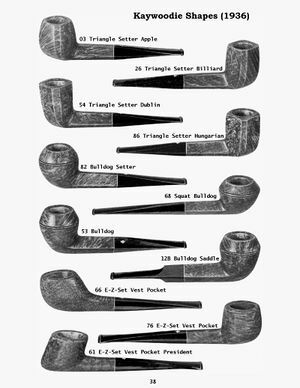 This is an ongoing effort to adapt information from the Collector's Guide to Kaywoodie Pipes into Pipedia articles. 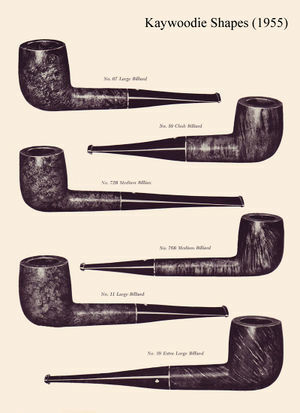 The Guide was first compiled by Chris Keene for his pipe pages at ChrisKeene.com. Chris used source material from Robert W. Stokes, Ph.D and additional support materials from Bill Feuerbach III, of the S.M. Frank Co.. Many thanks to these dedicated pipemen for their work in compiling this material. 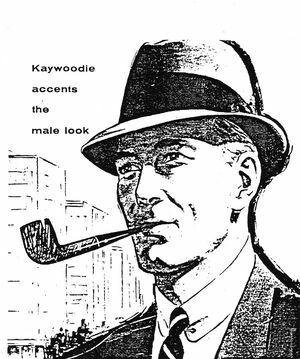 Pipesmokers who were born before 1950 have probably, at one time or another, smoked a Kaywoodie Pipe. As recently as the early 1970's, many local drugstores had extensive Kaywoodie Pipe displays. These later Kaywoodies, however, were generally lacquered "hand-burners" that probably did more to discourage pipesmoking than any recent anti-smoking campaigns. Unfortunately, it is this image of later Kaywoodies that is most prevalent with the majority of pipesmokers/collectors today. 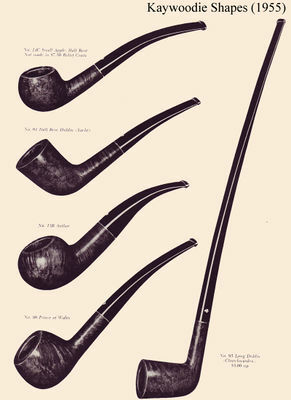 Contrary to this perception of all Kaywoodies as "drugstore pipes", many of the early Kaywoodie Pipes were quality briars that were available in an extensive range of shapes. 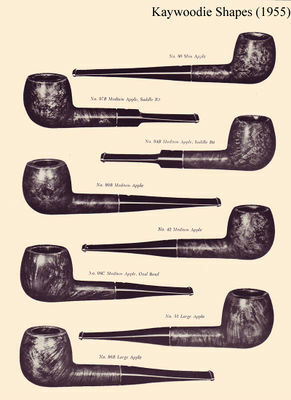 In recent years, many collectors have "re-discovered" Kaywoodie Pipes. 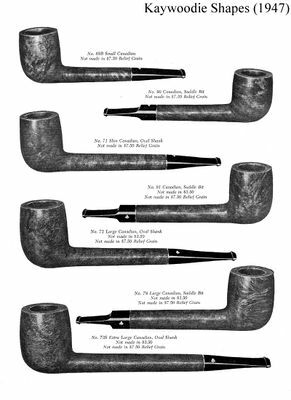 Ads for Kaywoodies, and/or requests for information concerning these pipes, have appeared in pipesmoking and related journals with increasing frequency in recent years. Readily available and reliable information on Kaywoodie Pipes, however, is virtually non-existent. 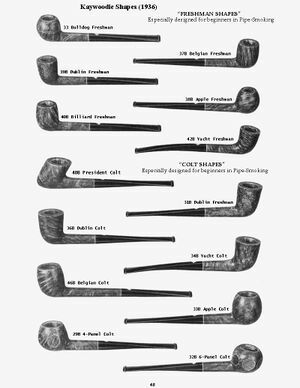 It is unfortunate that with the increasing popularity of pipe collecting in this country, U.S. pipe smoking history has largely been ignored. In its heyday, Kaywoodie Pipes was the world's largest consumer of briar and, contrary to popular belief, produced some extremely high quality smoking pipes, many incorporating innovative design features. This monograph is an initial attempt at documenting the Kaywoodie story. This should be viewed as an "initial attempt" in that it is based on information extracted from only a few catalogs and correspondence with a limited number of Kaywoodie collectors. The catalogs reviewed in this research span the period from 1936 to 1969 in roughly ten-year increments. Because of the gaps in catalogs, it is highly likely that there are many "holes" in the information presented here. The information available on pre­-1936 Kaywoodies, for example, is particularly vague and is largely speculative in nature. It is hoped that this initial attempt will provide a useful point of departure for future, more exhaustive research on this important, interesting, but neglected era in American pipesmoking history. 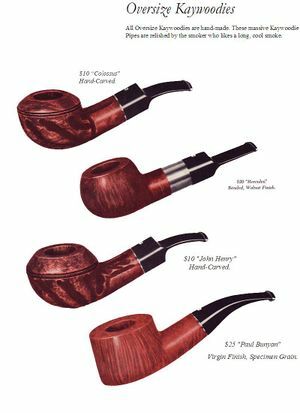 "The KB&B briar pipe brand existed from 1900 until just after World War I (with some overlapping with the Kaywoodie from 1915 -- 1917), :and collectors refer to the KB&B as a Kaywoodie transition pipe. During the early years of the 20th century a number of filter systems :were designed by the KB&B firm and incorporated into their Kaywoodie Pipes under the names of Synchro-Stem and Kaywoodie Drinkless3 :filters. During the late 1920's and throughout the 30's the Kaywoodie became a highly respected pipe in spite of its filter system (which :was popular among many smokers of the era) primarily due to the fine quality of the straight grain and the flame grain models. :Unfortunately, the hard-to-get-briar years of World War II marked the decline of the Kaywoodie Pipe, a plummet from which it has never :recovered as far as collectors are concerned...."
The pre-Kaywoodie KB&B pipes were marked on the shank with a cloverleaf around KB&B. Some early Kaywoodies had this same marking on the shank, but the practice was dropped sometime prior to 1936. Yello-Boles also had KBB in the leaf on the shanks, but did not have the ampersand found on Kaywoodies. Early (pre-1936) Kaywoodies had an "elongated" white cloverleaf on the bit, a large fitment, and four-digit shape numbers. The 1936 catalog shows a larger, "fuller" leaf, but lists two-digit shape numbers. Sometime between 1936 and 1947, the better pipes were marked on the bits with a black cloverleaf in a white circle. The white cloverleaf continued on the lesser pipes. However, this was not a consistent convention, as pipes of the same grade could have either type of leaf. The S.M. Frank Co. now owns the Kaywoodie name, but no longer makes pipes. However, Italian made "drugstore" grade Kaywoodies are still being marketed in this country. These Italian-made Kaywoodies have a "white­outline" cloverleaf logo. 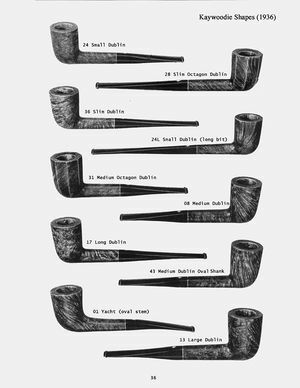 This Chapter presents a description of the grades that appeared in the Kaywoodie line of pipes for the period from 1936 through 1969. The information comes from Kaywoodie catalogs from 1936, 1947, 1955, and 1968-69. 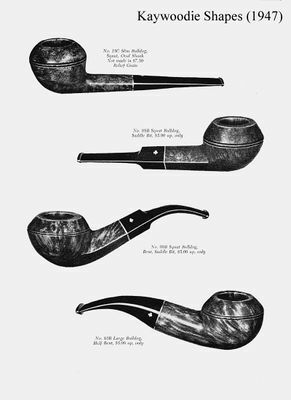 Four "undated" catalogs were also consulted as an aid in establishing the hierarchy of pipes in the frequently changing Kaywoodie line-up. Based on a comparison of prices in the 1955 and 1968-69 catalogs, these four undated catalogs appear to span the period from "after 1955" to "before 1968". 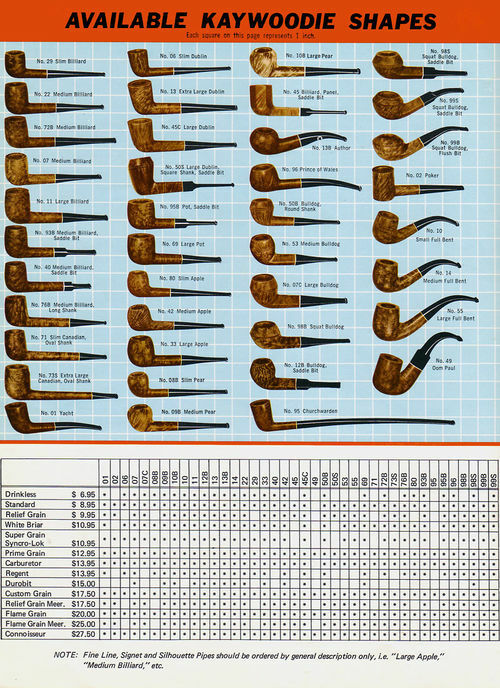 The 1936 Kaywoodie catalog lists only four grades of pipes (Table 1). These four grades, however, were available in 140 shapes (see Appendix). These 140 shapes included many that differed only in size (small, medium, large). For example, the "In-Between", "Colt" and "Freshman" shapes listed in the Appendix were merely smaller versions of the standard shapes, and the "E-Z-Set" shapes were "flat-bottom" versions of the standard shapes. 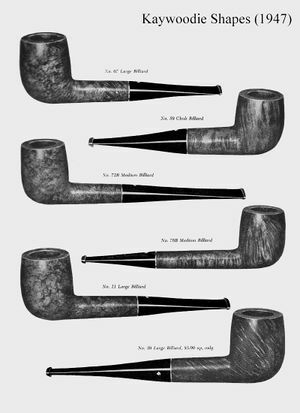 As shown in Table 1, the Straight-Grain pipe was Kaywoodies' top-of-the­-line, selling for $10.00 in 1936. The Straight Grain pipe did not appear again in the catalogs reviewed in this research until 1968-69 (see Section 3.4). The 1936 catalog shows 3 Super Grain models, selling for $5.00 each. One model is introduced as the "New Banded" Super Grain. The banded Super Grain had the white Kaywoodie cloverleaf logo in the bit and a wide metal band. The non-banded ("original") Super Grain had the white Kaywoodie cloverleaf logo in the shank of the pipe and was offered in two finishes, virgin and miami (slightly darker than virgin). Due to the gap in catalogs used in this research, it is not known precisely when the practice of putting the cloverleaf in the shank of the Super Grains was discontinued (the 1947 catalog shows the cloverleaf on the bit). The Super Grain was later downgraded and many new grades appeared above it (see subsequent sections of this Chapter). The early (original) Super Grains are particularly interesting not only because they were high quality briars, but because they were the only Kaywoodies (in the author's knowledge) to have the logo inlaid in the shank of the pipe. The 1936 catalog "Introduces an entirely new principle in pipe-smoking, the new Kaywoodie Carburetor". The carburetor device was basically a hole in the bottom of the bowl that was intended to control the mixture of smoke and air (drawn in through the bottom of the bowl), thereby affording a cooler smoke. With the exception of the 1947 catalog, the Carburetor appears in all the catalogs reviewed in this research4. The Carburetor was available in smooth or relief (sandblast) finishes. 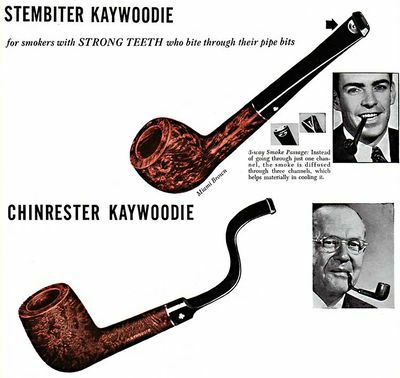 The workingman's pipe in the 1936 catalog was the Drinkless Kaywoodie. The Drinkless Kaywoodie sold for $3.50 and came in the following four finishes: 1) Thorn (sandblast); 2) Walnut ("rich, warm brown that blends perfectly with brown suits, tweeds and brown hats"); 3) Suntan ("light summer-pipe color to go with light-color fabrics"); and 4) Dark ("rich cherry red"). 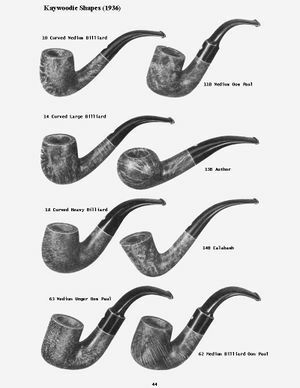 The 1947 Kaywoodie catalog shows 12 grades of briar pipes and introduces the Kaywoodie Block Meerschaum (Table 2). 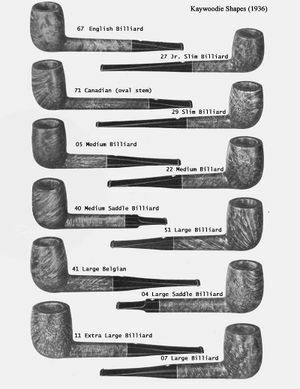 The briar pipes were available in 69 shapes (See Appendix). 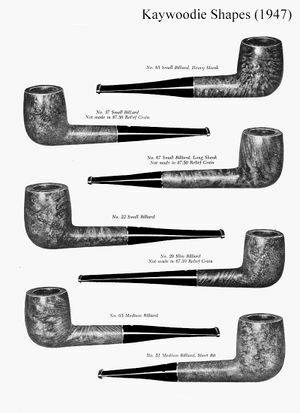 In addition to these individual pipes, the 1947 catalog shows two- and seven-pipe matched grain sets(5). 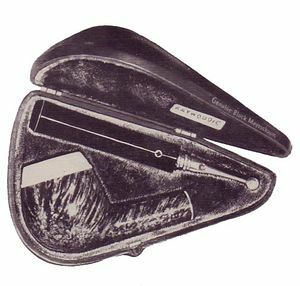 The Block Meerschaums were available in straight or bent shapes and came in leather-covered cases. 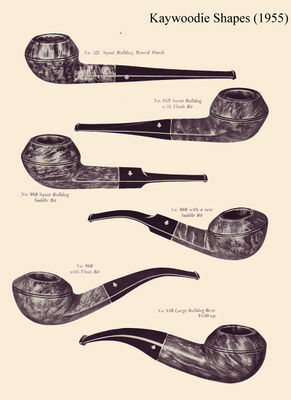 The Kaywoodie Block Meerschaums in the 1947 catalog were smooth pipes priced from $17.50 to $50.00, depending on size. The Ninety-Fiver and Centennial pipes were apparently "anniversary pipes" offered to commemorate the firm's 95th and 100th anniversaries, respectively(6). The Ninety-Fiver and Centennial pipes both had wide metal bands and came in cases lined with velvet and satin. Both are highly-prized by collectors. Virgin finish, specimen grain "Paul Bunyan"
($25)Virgin finish, banded specimen grain "Goliath"
The Meerschaum-Inlaid (typically flame grain grade with Turkish meerschaum inlaid bowl), Silhouette (black sandblast finish with wide band) and Flame Grain pipes were all comparable in quality. 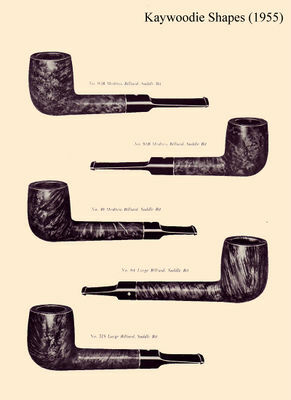 The Relief Grain, Super Grain, Hand-Made Super Grain, and Drinkless pipes rounded-out the 1947 Kaywoodie line of pipes. 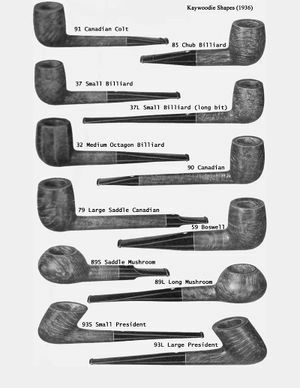 The line-up of pipes in the 1955 catalog (Table 3) was more extensive than in previous years. 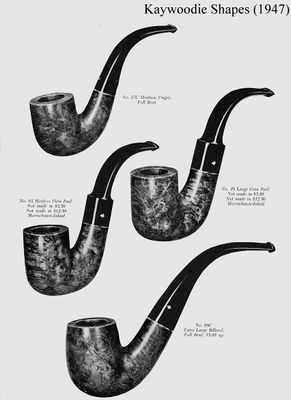 The catalog presented an expanded line of meerschaum pipes and introduced a 4-pipe set of Matched Grain Pipes, as well as several pipes with "special features". The number of shapes available (see Appendix), however, was not substantially different from the number offered in the 1947 catalog. 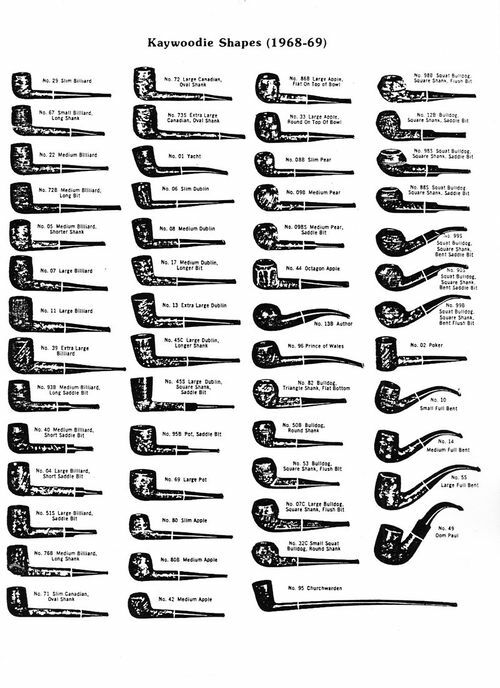 The "star" of the 1955 catalog was the Meerschaum Character Pipe. According to the catalog, "A very limited number of these [block] meerschaum character pipes are carved by Kaywoodie sculptors . . . each a true-life reproduction of a famous man." The famous men honored on these pipes included: George Washington; Abraham Lincoln; Thomas Jefferson; Andrew Jackson; Stonewall Jackson; Daniel Boone; Theodore Roosevelt; Sir Walter Raleigh; and Mephisto. Export Pipes-- Pipes without the Kaywoodie screw-in filter system. Available in Super Grain to Connoisseur grade pipes. Fit Rite. "Fit Rite" refers to the design of the bit ("absolutely flat on top and bottom from the tip right to the saddle"). Chesterfield8-- Identical to the Peterson System Pipe (reservoir in pipe shank to collect moisture, Peterson style lip, military mounting). Available in Super Grain, Relief Grain, Flame Grain, and Connoisseur grades. Chinrester. "S-Shaped" bit-- "Chinrester pipes perform a special function by resting comfortably on the chin, thereby easing the strain on smokers whose jaws tire quickly or whose teeth are weak." Stembiter. "For smokers with strong teeth who bite through their pipe bits." The bit was "notched" in front of the lip of the bit to "conform to the shape of the teeth". The bit incorporated a 3-way smoke passage with two of the passages terminating in the lip-end of the bit and the third in the notch on the top of the bit9. (Also see "Durobit", Section 3.4). White Briar-- "Bowls of prime imported briar, with hard white finish that keeps its lustre and sparkling whiteness." Filter-Plus-- Interchangeable bowls in metal shanks. Two basic models were available. The 1955 model featured six "screw-on" interchangeable bowls. In the late 1950's (after 1955) or early 60's, the Filter-Plus Deluxe pipe was introduced ("gold-like" finish on shank). In the early to mid-1960's, the Filter Pipes featured a "strap-on" bowl with a threaded base for ceramic filters. The bowl on these pipes was held in place with a spring-loaded pin that could be released by pulling the bit. The 1968-69 catalog offered an interesting assortment of traditional and free-hand styles (Table 4). The traditional pipes were available in over 50 shapes (see Appendix). The Birdseye and Straight Grain pipes were the top-of-the-line, selling for $100 each. Every Birdseye and Straight Grain pipe was registered and, according to the catalog, would "be serviced for life". The Birdseye and Straight Grain pipes were packaged in special hand-fitted leather cases. Though both pipes are still highly regarded, the Birdseye pipe is probably the rarest of the Kaywoodie Pipes and is highly sought after by collectors. 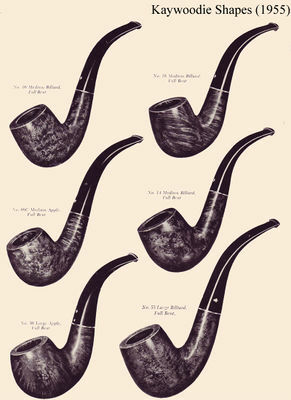 The Kaywoodie Originals were "hand-carved, one-of-a-kind pipes" that were available in six general shapes in a choice of smooth or "textured" finishes. The Originals, like the Birdseye and Straight Grain Pipes, were registered and would be serviced for life. The Collector's series was also available in six shapes (1C-6C) in a choice of smooth or sandblast finishes(10). The Heirloom pipes were hand-carved briar heads of a Nobleman, a Prophet, and Satan. 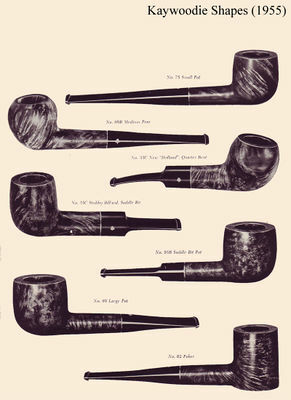 An undated catalog (probably from the late 1950's or early 1960's) offered these pipes as "carved heads" for $15.00 each. 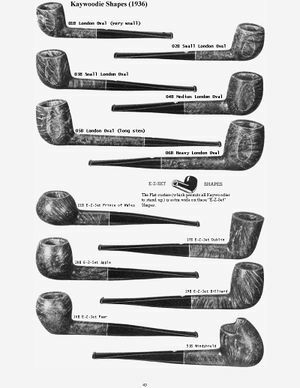 Another undated catalog (probably from the mid-60's) offered the Heirloom pipes for $25 each. 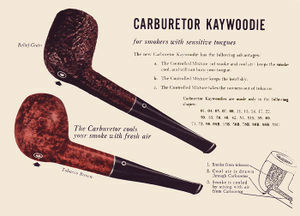 The Kaywoodie Regent featured an "India-Grain Rubber Bit" (simulated briar grain similar to the Dunhill Cumberland bit). The Durobit pipe was a variation of the 1955 Stembiter. The Durobit featured a "twin outlet" bit instead of the 3-way outlet used on the Stembiter bit (see Section 3.3). The Super Grain Syncro-Lok also featured a modified Kaywoodie bit design. A common problem with the Kaywoodie threaded bit is its tendency to "cant" to the right over time (i.e., as the threads wear, the bit can become twisted to the right)11. The Syncro-Lok bit, that "twists to any angle most comfortable to your individual bite," was apparently intended to eliminate this problem. 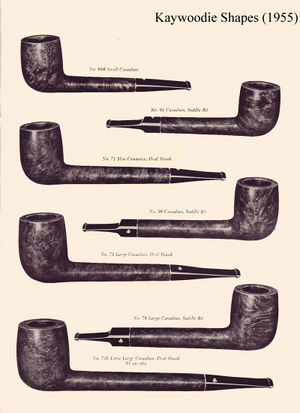 In addition to the two-, five-, and seven-pipe Matched Grain pipe sets listed in Table 4, the 1968-69 catalog introduced the Presentation Pipe. The catalog states that in "Every 8 or 10 thousand briar blocks, we come across a single piece that is as near to perfection as briar can get. This rare find is set aside and turned over to a master pipe craftsman. He lovingly sees this precious briar through each step, until it takes shape as one of the rarest pipes in the century." The Presentation Pipe was packaged in a walnut grain, velvet lined, leather case. 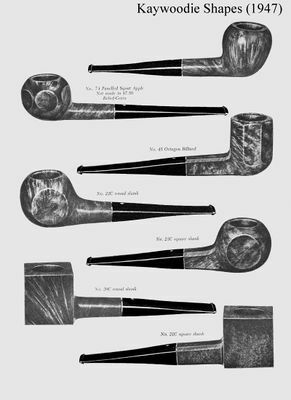 (See Section 3.5 for description of other Kaywoodie Presentation Pipes). Presentation Collection. "The most illustrious collection of pipes ever assembled - the Kaywoodie Presentation Collection. It presents a set of 28 Kaywoodie Matched Grain Pipes . . . pipes as perfectly, flawlessly, magnificently matched as a string of rare Oriental pearls. Over 500,000 blocks of pristine briar must be sorted to find just one such matched collection; hence no more than 12 sets can be produced in any one year. Hand fashioned from tapered bit to burnished bowl, every pipe in this Collection becomes a prized possession. A Carved Headbriar [see note concerning "carved heads" in the discussion of Heirloom pipes, Section 3.4], a Calabash and a Meerschaum complete this Collection of 31 pipes. This precious ensemble is housed in a custom-designed walnut cabinet of distinguished elegance. It contains a tobacco humidor and a handy compartment for pipe smoking utensils. A brass plate, engraved with the recipient's name, personalizes the presentation" (Price: $2500). The Presentation Collection did not appear in the 1955 catalog, but was apparently introduced shortly thereafter. A "brief" article in the September 17, 1956 issue of Newsweek supports this contention. 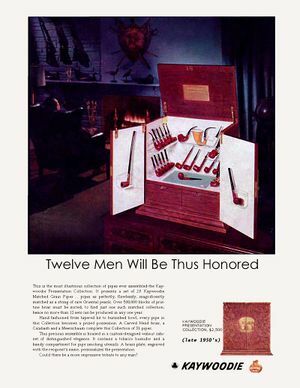 The article, entitled "Pipe Dream", contains a photo of the Presentation Collection, which is described as the "costliest pipe set ever marketed in the U.S." (Lowndes notes that a small (undated) WWII era catalog showed the Presentation Collection in a smaller cabinet with legs that sold for $1000.) Presentation Block Meerschaum. Smooth or sculptured ("dimpled") finish with black or "Ambera" (simulated amber) bits ($35-$50, depending on size). Hi-Bowl. Tall, tapered bowl in six shapes (see Table 5). Available in smooth or "rough" finish ($10). Setter. No shank, just a ridged hole for a slender, filter-free, push-bit. Available in "flat bottom" (hence, "Setter") panel, billiard, and poker shapes. Smooth or textured finish ($10). Tuckaway. 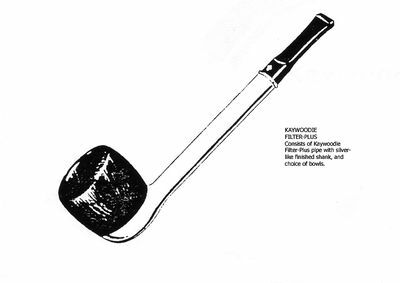 The 1955 catalog shows a Drinkless Tuckaway that was simply a smaller version of other Kaywoodie styles. 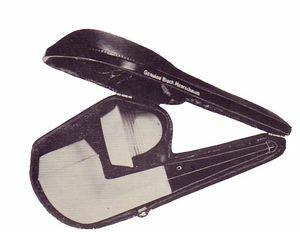 The Tuckaways of the 1955-1968 period had military mountings, filter-free see-thru bits, and were packaged in a leatherette case. Available in Standard, Relief Grain, and Super Grain grades ($6-$8, depending on grade). Miniatures. Two-inch miniature replicas of "their big brother", complete with the Drinkless fitment and Synchro Stem. The catalogs show these as individually-cased pipes but multiple pipe sets were apparently available. Price: $5. Miniatures. Two-inch miniature replicas of "their big brother", complete with the Drinkless fitment and Synchro Stem. The catalogs show these as individually-cased pipes but multiple pipe sets were apparently available. Price: $5. Colossal Super Grains. Available in three "oversize" shapes (see Section 3.2) in hand-carved or smooth finishes ($5). 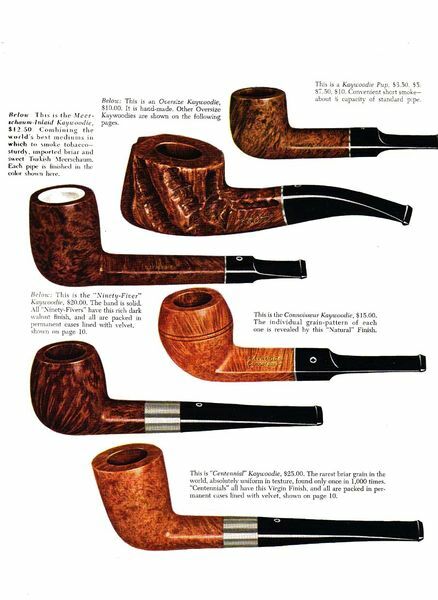 Other $5-Kaywoodies of this period included: the Litewate Super Grain (w/nylon comfort-bit); the Coral White Briar; Natural Burl; and the Syncro-Lok "500" and "600" pipes. The previous sections of this Chapter summarize information taken from eight Kaywoodie Catalogs from the period 1936 to 1969. Because of the gaps in the catalogs, it is highly likely that many "holes" exist in the material presented in this monograph. 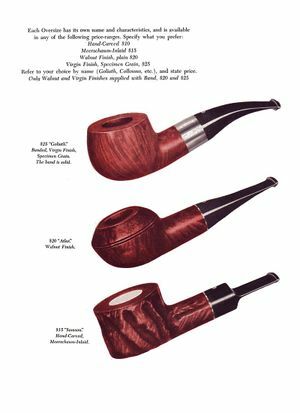 This section presents a brief overview of some Kaywoodie Pipes that did not appear in any of the catalogs consulted in this research. The information on these pipes was provided by W.R. "Bill" Lowndes (a well-known Kaywoodie Collector from California). Mission Briar. WWII vintage Manzanita pipe. Not marked "Kaywoodie". Lowndes notes that one of the two in his collection has a KBB leaf on the shank. Drinkless Shellcraft. This pipe had a large, non-threaded fitment. The white logo on the bit was shaped like the Kaywoodie fitment. Some had KBB leaf on the shank. Lowndes notes that his Shellcraft does not have Kaywoodie shape numbers. Gale. Lowndes notes that he has two: No. 17 dublin (Flame Grain with small white logo, extra large fitment, and a metal rim on top with a sliding windscreen); No. 07 large billiard (with same large fitment as dublin, but no logo). Heritage. 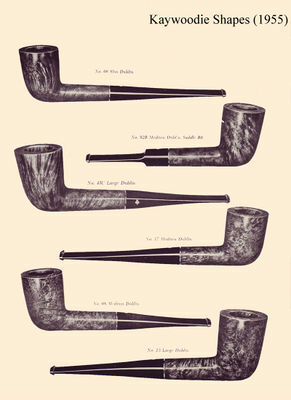 Lowndes suggests that the Heritage pipes were introduced in the 1960's to compete with Dunhill. No fitments. Smooth finish called "Heirloom", sandblast called "Antique". Lowndes notes that there was a carved Heritage similar to Barling Quaints. Pipes were not marked "Kaywoodie", and logo on bit is a double diamond. 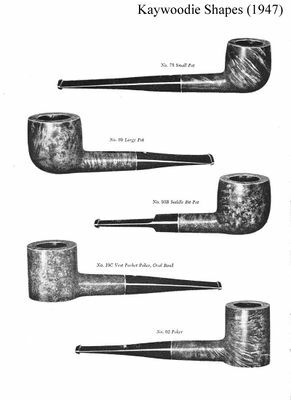 Lowndes notes that the Heritage pipes in his collection are small to medium-­size pipes and have Kaywoodie shape numbers. Lowndes suggests there may have been a special Heritage catalog. Vaduz and Zurich. English Kaywoodies are now made by Oppenheimer pipes. Lowndes notes that English Kaywoodies with the "screw-in bit" come in Ruby Grain, Custom Grain, Standard, and Relief Grain grades. 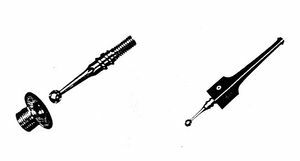 The traditional push-bit models come in Continental Plain and Relief, London Made, Minaret, Airway Polished No. 707, and Lightweight grades. Prices in 1985 ranged from 9.50 (pounds) to 26.00 (pounds). Lowndes notes that the Super Star was a special edition English Kaywoodie made of finest briar with a handmade silver band. Lowndes has two: one from Zurich with a large white-outlined logo, and beautifully cased; and one in walnut finish with the black-­in-white logo. A recent catalog shows the Super Star without a band and the ordinary small white logo. A 1985 letter from Oppenheimer states that the black-in-white logo has been discontinued and only the regular white logo is now used. It should be clear from the preceding chronology that the firm of KB&B probably produced hundreds of thousands of pipes in the years since 1915. There is certainly no shortage of Kaywoodies today., The mid- and low-grade pipes are available in abundance at flea markets and estate sales, and from numerous pipe traders/collectors. Flea markets are particularly fruitful hunting grounds for Kaywoodie Pipes. Many gems have been discovered among the dusty, heavily oxidized pipes that have found their way to flea markets around the country. The author has found 4-digit Super Grains, Connoisseurs, Flame Grains, and 4-digit pre-fitment Kaywoodies at flea markets for less than $5 each. Another obvious source of Kaywoodies is other collectors. This source is particularly useful for the rarer, high-grade Kaywoodies. 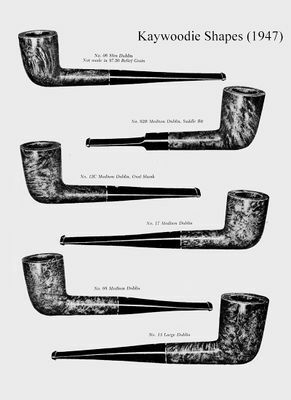 A number of pipe collecting journals carry ads from Kaywoodie collectors and can be a valuable source of general information concerning Kaywoodies, as well as in identifying other Kaywoodie collectors. Readers who may not be familiar with these publications should consult their local tobacconist for details. 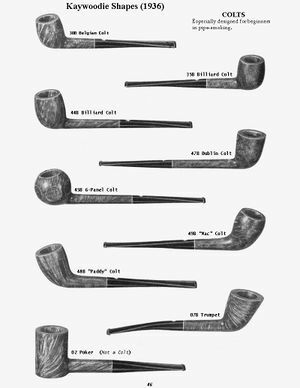 In fact, pipe shops that deal in estate (pre-smoked) pipes should not be over­looked as a possible source for Kaywoodie Pipes. 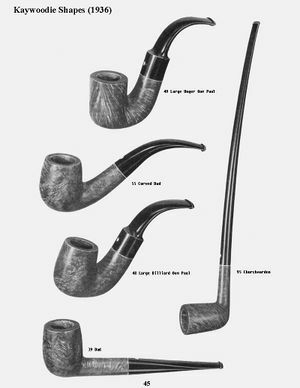 Additionally, there has been a recent proliferation of mail-order pipe dealers who occasionally offer Kaywoodie Pipes. 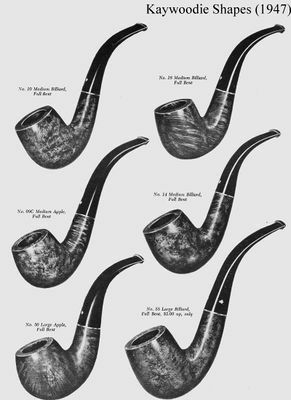 These dealers frequently advertise in various pipe smoking journals and can be another potentially useful source for Kaywoodie Pipes. While there does not appear to be a shortage of Kaywoodie Pipes, there is a serious lack of guidelines for accurately dating and pricing Kaywoodie Pipes. Like most pipemakers, KB&B did not use any consistent, easily identifiable system for dating their pipes. Hence, only the following, general guidelines for dating Kaywoodies can be suggested. Check the Shape Numbers. 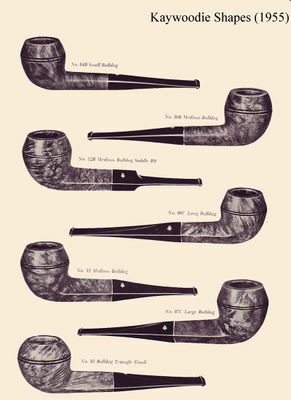 If the pipe has a 4-digit shape number, the pipe is probably of "pre-1936" vintage. If the pipe has a 4-digit shape number and does not have the threaded fitment, it is probably from before 1925. The information in Chapter 3 on pipe grades, along with the shape lists in the Appendix, can, also be useful in dating a pipe. 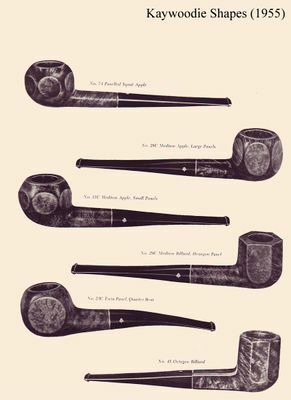 Because grades and shapes frequently changed, this information can be useful in establishing an approximate date, especially if the pipe in question is of an unusual shape and/or grade. Fortunately, the older, more desirable Kaywoodies (i.e., those of pre-1936 vintage) can be identified by their 4-digit shape numbers. Examine Logo, Stampings and Fitment. The pre-WWII Kaywoodies had elongated white cloverleaf logos and large screw-in fitments (with the possible exception of the pre-1925 and "export" Kaywoodies, which had no fitments). Some of the pre-1936 Kaywoodies were stamped (on the shank) with a cloverleaf around KBB. Sometime between 1936 and 1947, the better pipes were marked with a black cloverleaf inside a white dot. However, because many of the pipes in the 1968-69 catalog still show this type of logo, the black-in-white logo merely indicates a "post 1936" vintage. Current (Italian-made) Kaywoodies have the "white outline" logo. With the exception of the early (pre-1936) pipes, it is very difficult to date Kaywoodies precisely. Typically, one must rely upon "guestimates" based on a number of factors. As a final suggestion, it never hurts to ask the seller/owner about the history of the pipe (it may turnout that the owner of the pipe knows approximately when the pipe was purchased). 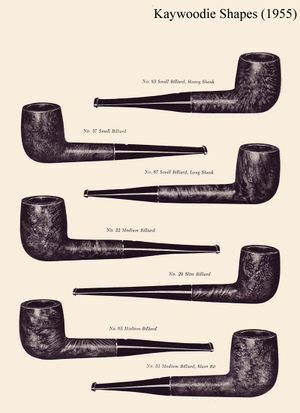 Because there are relatively few Kaywoodie collectors (the number appears to be growing, however), and because there is a general lack of knowledge concerning the basic hierarchy of Kaywoodie Pipes, there does not appear to be a widely accepted pricing scale for Kaywoodie Pipes. 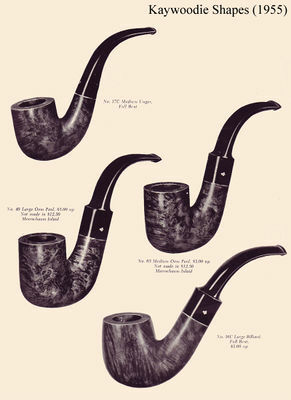 As an example, a leading mail-order pipe company recently offered low-grade Kaywoodies (Signet, "600") at the same (or higher) prices than Flame and Matched Grain Kaywoodies. Based on very limited information, the current dealer's price for Flame Grain grade Kaywoodies appears to be in the range of S25 to $35, depending on condition. The annual inflation rate in this country has averaged about 4% per year since 1950. At this rate, 1988 consumer prices are about double the 1968 prices. The dealer price of $25 to $35 for Flame Grain grade Kaywoodies, then, appears reasonable13 (as shown in Table 4, Kaywoodie Flame Grains sold for $15 in 1968-69). 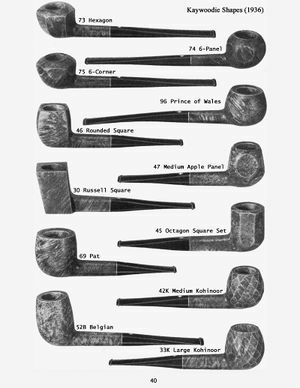 Therefore, as a rough rule-of-thumb, one could simply double the 1968-69 prices given in Table 4 (see Section 3.4) to estimate "current prices" of Kaywoodie Pipes. This, of course, should not be taken as a hard-and-fast rule, as a number of other factors such as condition, age and 'rarity can significantly affect prices. The seller's knowledge (or lack of knowledge) also affects price. As noted earlier, Kaywoodie prices may be substantially lower at flea markets and estate sales. (Prices can also be substantially higher if the seller believes that a pipe is "old" and/or "rare"). 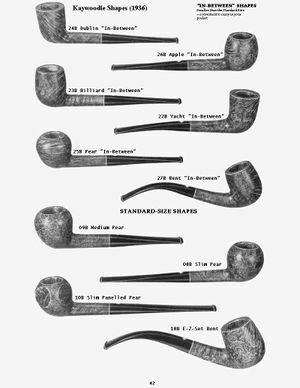 Perhaps the best source of information on the current value of Kaywoodie Pipes, is other (knowledgeable) Kaywoodie collectors. Of course, the bottom line on the value of any collectible is what the collector is "willing to pay". As a final note, the Kaywoodie collector should bear in mind that, with the possible exception of the older, higher grade pipes, there is currently no shortage of Kaywoodies. For the collector who is willing to shop-around, it is still possible to develop an extensive collection of Kaywoodie Pipes without spending a great deal of money. 64 -- Vest Pocket "In-Between"
(no number) - Gravity "In-Between"
05 -- Medium Billiard . 86B - Large Apple, Flat Top Bowl . 1. Hacker, R.C. The Ultimate Pipe Book. Autumngold Publishing, Beverly Hills, CA, 1984, pp. 256­-259. 2. 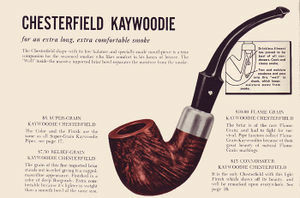 William Lowndes, a well-known Kaywoodie Collector from California, suggests that KB&B may have experimented with other names before settling on "Kaywoodie". Lowndes notes that he has an early KB&B Pipe stamped "Dinwoodie". 3. Author's Note: Lowndes suggests that the Kaywoodie "Drinkless" (screw-in filter) fitment was introduced about 1925. The Synchro-Stem and Drinkless names refer to complementary elements of a single design feature. "Synchro-Stem" refers to the threaded insert in the shank of the pipe that accommodates the "Drinkless" metal filter in the bit of the pipe. 5. 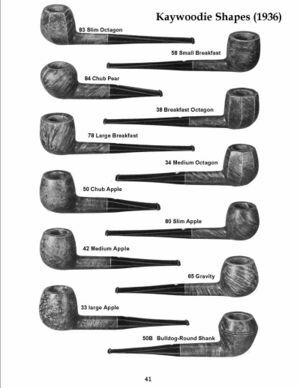 In The Ultimate Pipe Book (p. 256), Hacker mentions sets of twelve and fourteen pipes of matching briar. The twelve and fourteen pipe sets mentioned by Hacker do not appear in any of the catalogs reviewed in this research. 6. The appearance of the Centennial pipe in 1947 seems somewhat premature. If the founding of the firm is taken as 1851 (see Chapter 2), the firm's centennial would have been in 1951. 7. Subsequent Kaywoodie catalogs do not show the "Hercules", "John Henry", or "Paul Bunyan" oversize styles. 8. A 1938 Yello-Bole catalog contains a photograph of a "Jumbo" Chesterfield. The pipe in the photo has a four-digit shape number (No. 3068C). This would suggest that: 1) the Kaywoodie Chesterfield was available much earlier than 1955 (but wasn't shown in earlier Kaywoodie catalogs); and 2) the use of 4-digit shape numbers continued into the mid-30's (e.g., the photo used in the 1938 Yello-Bole catalog could have been a pre-1936 "file photo"). 11. 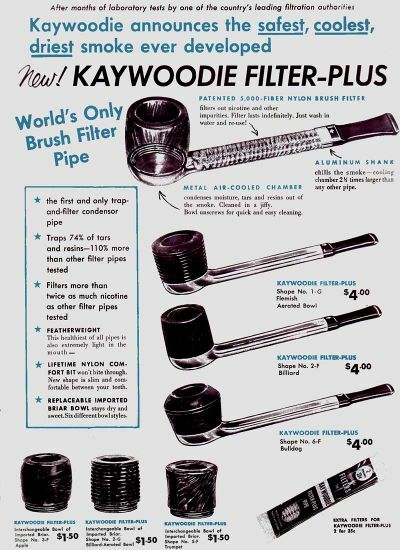 A 1947 catalog notes that "The mouthpiece [Bits] of Kaywoodie Pipes are 'canted' slightly to the left when new. Regular use will shortly bring them into perfect alignment." 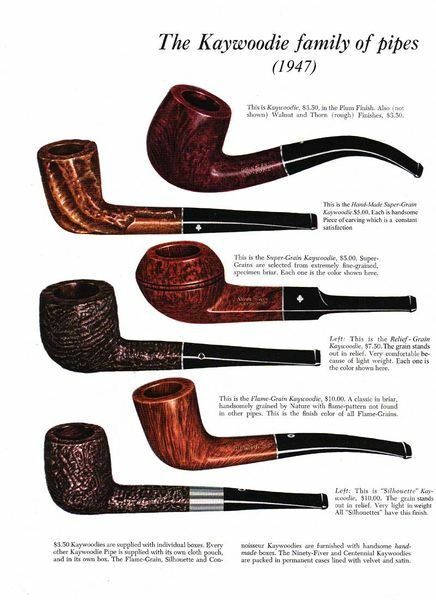 12.Author's note: The 1955 catalog offers pipes with matching briar pipe rests (called "Briar Mates"). The Flame Grain Briar Mates were available in a choice of Black or "Yellow Ambera Bits". 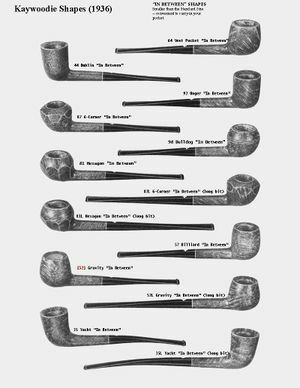 Also see "Presentation Block Meerschaum" (Section 3.5). 13. Pre_smoked pipes, however, generally sell for about one-half the "new" price. On the other hand, it could be argued that briar prices have increased faster than prices for most other consumer goods and the dealer prices quoted above may still be reasonable, even for pre-smoked pipes. a) Small (half-size) versions of 3.50, 5, 7.50, and $10 grades. b) In case lined with velvet and satin. c) In morocco leather case, lined with white satin and velvet. a) These pipes are described in the previous section of this Chapter. a)These are shape numbers and/or descriptions that did not appear in any of the catalogs summarized in Sections 3.1-3.4.
b)These numbers appeared in the 1936 catalog with different descriptions (see Appendix). This page was last edited on 9 February 2017, at 15:06.